Hacking, data security, cyber security. As we are hearing more and more about the importance of keeping data safe, a group of St Patrick’s Technical College students were able to get a special behind-the-scenes look at an Adelaide company fighting the good fight. 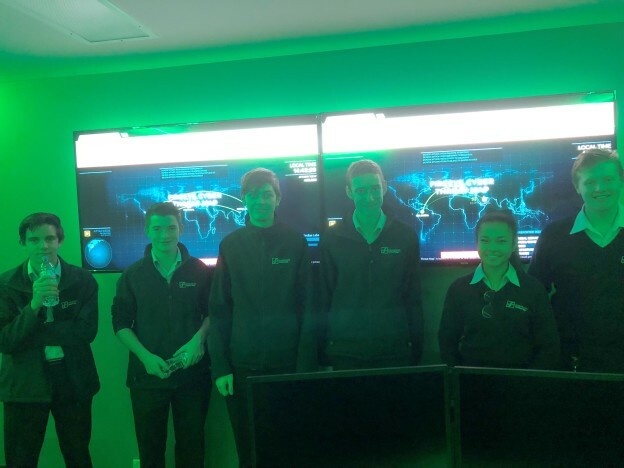 OpSys, located in Thebarton, hosted StPatsTech’s IT students this week to teach them more about the cybersecurity and how easy it is to access unsecure data. OpSys Managing Director Matt Fabri gave the students an excellent presentation about the industry and OpSys’ solutions before the students were taken on a tour of the company’s facility. As part of the tour, the students saw a data storage room and The Green Room, a room which changed colour depending on the level of incoming threat. Following on from this, students completed an Analysis Task that looked at the key features of the presentation. Students gained a great depth of knowledge about hacking, viruses and how to keep safe from potential threats. Mr Fabri demonstrated how electronically vulnerable people, industry and business are, focusing on what students should look out for in “cyberspace”. StPatsTech’s STEM teacher Bradley Sheridan first learnt of OpSys through an Advanced Technology Project (ATP) event where Mr Fabri was a presenter. Darlene Voss and Mark Haughton from the ATP joined the excursion along with Northern Adelaide P-TECH Industry Liaison Officer Toni Hartley joined the students for the excursion. Mr Sheridan said the students enjoyed the visit, in particular how viruses and hacking can affect day-to-day life. “OpSys showed me how easy it is for people to access personal details through my technology,” said student Alex Wilton. Ms Hartley said the presentation from Opsys enhanced the College’s IT course, which is part of the Australian Government’s $5.1 million P-TECH Australia program. The IT course is being delivered in partnership with Saab Australia, which has specialised in the development of advanced defence, security and civil aviation systems in Australia for more than thirty years. For more information about StPatsTech’s IT course see the programs page here. This entry was posted in Industry Office on 02/07/2018 by St Patrick's Technical College.